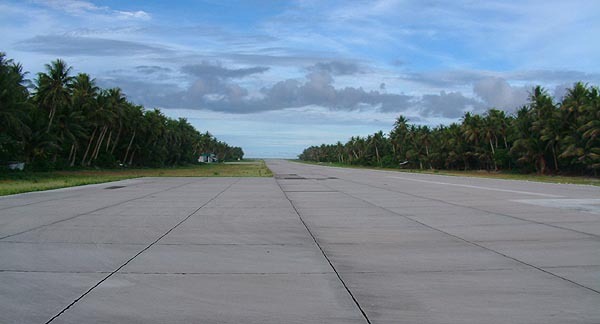 The runway on Falalop. When you stand on it, you are looking the width of the island. “Before I left Falalop, there was no airport on this island,” Manuel says, “so when I came back and looked around. ‘Oh?, How come my island is divided into two parts?’ We were feeling, we knew all of this island but it looked different from before. Only a few coconut trees, only a few banana trees were left over. This is 1947. The Americans had moved. And they just said ‘here you are'." “The men here during the war,” Mariana Chim recalls, “they say that, during the air raids they were not frightened until one day a Navy placed all the islanders on that Fedraey island so the military could work freely without the islanders interfering. And then, when those men came back to this island, those same men who had not been afraid during the air raids, they found the runway to be in place in their precious taro patch. They got frightened. Remains of an American bunker near the upper end of the runway. 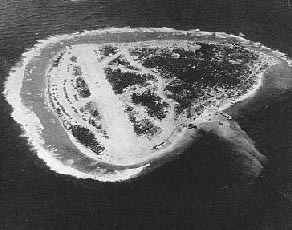 Air photograph of Falalop during the American occupation shows very sparse vegetation. Courtesy of Emmett Baker. “I couldn’t really picture Mogmog before we went down to Fedraey,” Hosay remarks. “But when I came back up, there was a road around the outside of the island. You could just look out from here and see who’s walking on that side, it was so clear. Only a few trees remained here on the island. Because they cleaned up everything." "Luckily, they put a fence around our cemetery. They didn’t bother our cemetery. Maybe they just saw the rocks and they knew that this is our cemeteries. So they put fence around all the cemeteries that they found here on the island to protect them. 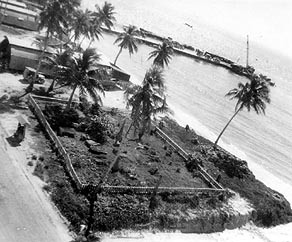 An oblique aerial shot of the cemetery on Asor during the war. The military dock and some quonset huts are visible in the background. Photograph courtesy of Drury C. Lee. This unidentified photograph is believed to be the military base on Asor, as seen from atop the Japanese watchtower. Courtesy of Paul Gremley. “After the war, they just bulldozed everything—I mean everything—off the end of the runway,” Mariano emphasizes: “trucks, remnants of trucks, pieces of machinery, airplanes, they just pushed them over. And the waves washed them away. When I was young. I used to go out there and sit on the wings of airplanes, in the water, and we fished with fishing poles. 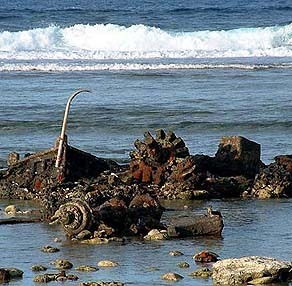 But now you cannot find any airplanes sitting there, they were wiped away. Some of the military debris still remains off the end of the runway at Falalop..
An air-raid shelter made of corrugated tin covered with dirt and vegetation. “There’s still some debris there,” Mariano continues, “but compared to the whole pile of debris before that I can still recall, today I should say, ‘it’s cleared up.’ I mean, that’s how big a difference it is. “The Americans used Asor as a headquarters,” Flomina Yetang points out. 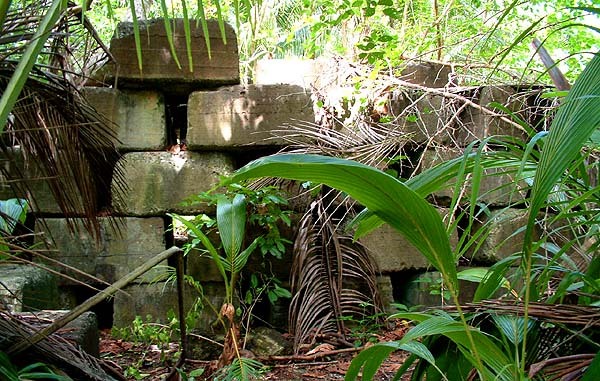 “Now there are concrete slabs, we have here, all over this island, concrete slabs left over from the war. But when the Navy left, they left Quonset Huts. And warehouses full of beds and full of almost everything. Their freezers, ice boxes. But no electricity. They just left those things." 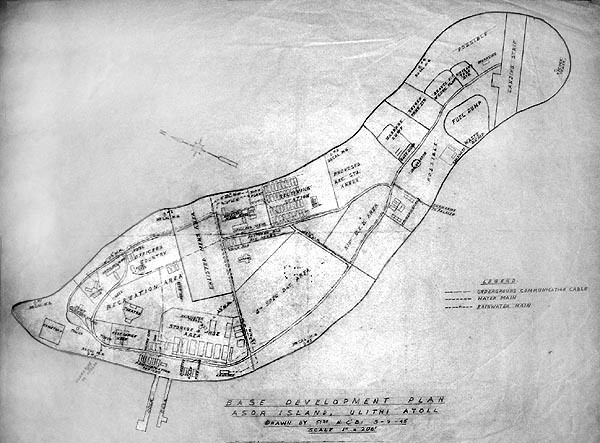 1945 map of the military base on Asor shows the extent of the military transformation of the island, and hints at how much stuff was left behind when the military pulled out. Courtesy of the Yap Land Resources Office. Click here to download a larger, more readable image. “The people here, they start looting!" Flomina and Pedrus laugh. "They started putting things away and what else. Life was a luxury: we came back to all these building, housing and all that food, just piled there waiting, pork, corned beef, peanut butter, and all kinds of canned meat. You just go, ‘Ah, this is what I want.’ Take out, eat a little bit, you’re not used to it, you throw away the rest. Especially corn, beans, we were not used to this. The taste was different. We got rid of that, but we went for the meat. 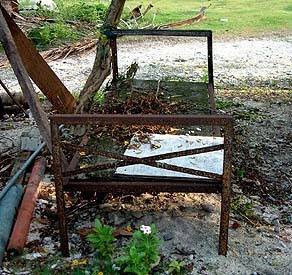 One of the bedframes remaining from the U.S. Military. “One of the warehouses was filled with mattresses and bed frames all the way to the ceiling. We used them—some used them wisely and some did not. 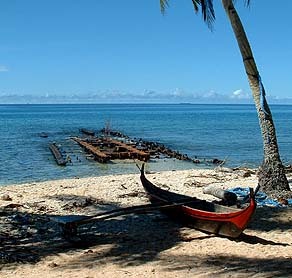 They’d take them, put them under coconut trees, and they just left them there. "Some took the mattresses to the water, used them as floats, and put under the coconut trees; and some took the bed frames, put them in the water, put the mattresses on and used them until the high tide came in and they got really soaked. They just left those down there. “But before the Navy left, the chief or the king who lives in Mogmog asked them to destroy most of the stuff. So they burned a lot, and they buried a lot. So most of the houses you will go to you will see those Navy remnants, and so whatever the islanders could grab, they grabbed and put away. “Then people from Public Works in Yap came, and then also a group from Hong Kong came, and took some equipment away. But when the people here heard that they were coming, they dug holes and put inside like tin roofing and tools, and whatever they could find, they stored them in there and concealed it. Remains of a crane near the old U.S. dock on Mogmog. 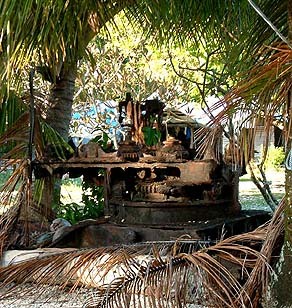 Rusted remains of the military dock on Mogmog. 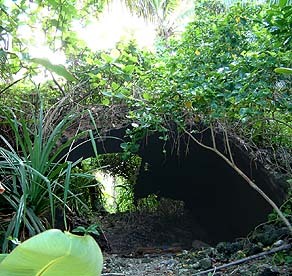 Similar remains are found off other islands. “At that time, we were still sort of afraid, and also we listened to our chief, our former chief from Mogmog, because he was the one who negotiated with the Americans. We were lucky in that, the former chiefs that we had, they didn’t allow anyone to use any of those this kinds of boat that they had, or any vehicles. There were a lot of vehicles left behind. "And a lot of fuel. The people used the fuel for lamps, they’d make ‘oilers’: they put wick through something and put gasoline or kerosene or whatever, and that’s what we used for lamps at that time, because all the electricity was shut down. “But the chief, he says ‘no,’—not even a store. He didn’t want anyone to bring in a store to Ulithi. Until later on some people, especially from Mogmog, some elders, they went ahead and started their own stores in Mogmog, and then that’s when the other islands start putting up stores." These large concrete blocks are anchors for the buoys used to moor American Naval ships. "See the chips missing from the corners," Mariano says. "When we would run out of matches, we reverted to our old way of making fire. And this stone produces a particularly good spark." “When we reached the islands, especially Falalop and Asor, the Quonset huts were there. Beds were there, mats, coffee, everything. Some people just got in, got up on the bed and in the morning they started cooking and drinking coffee and all those things. Go, go, go, go, until a couple of years later it begin to deteriorate. The mats got dirty and there was no way to clean them. All those sheets were used for dead bodies, because that’s what we usually do. “And finally people went down on the floor—no more beds, and no more coffee. So we started eating our own food. We asked Yap for some food at the time, because the island, the topsoil was scraped off. It was thin, almost like paper, so it was hard to grow things at the time. But that’s when we started planting again, and so I think only two or three times that food, potatoes, were sent to us from Yap. 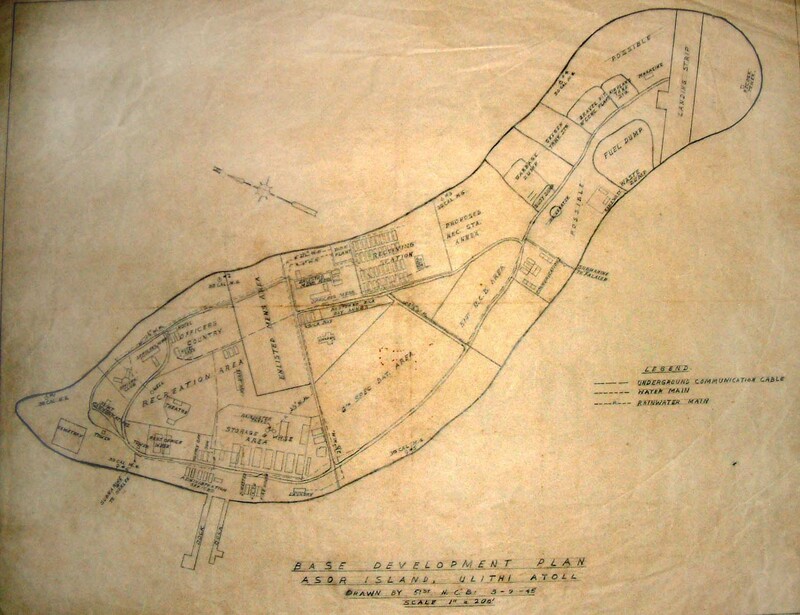 "And finally, people started breaking down the Quonset huts and building their own houses. 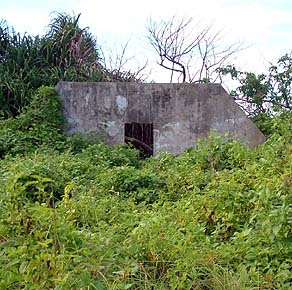 There were forty Quonset Huts, for military barracks, lined up on Asor Island, and all these things were broken down and used for our own houses. “First roofing tin roof, then finally when the tin roofs failed, there was still no place to buy a tin roof, and no money, so when the tin roofs were worn out, we start using thatched roofs." 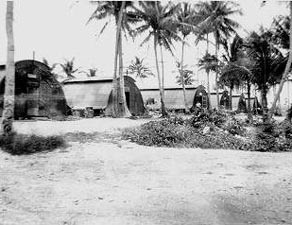 Quonset huts on Sohl'loay during the War. Photograph courtesy of Emmett Baker. 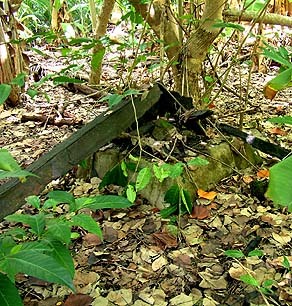 Crumpled remains of the Japanese watchtower in the regrown forest on Asor. "Also, there was this Japanese watchtower and there was a wooden house on top. They’d stay there and watch. I knew about this because I was one of those who went up there. And we dismantled it and took it to Mogmog and built a house with it. "And finally, all those military houses were all taken apart and each person used the materials for his own house, and built it where he had to build and so on. “So, what I respect the old chief for is that, what if he didn’t stop us, and we came to depend on what the military had left behind, and suddenly, that runs out—then where are we? So we were lucky that we didn’t adopt the use of all those things. Instead, we started making canoes." 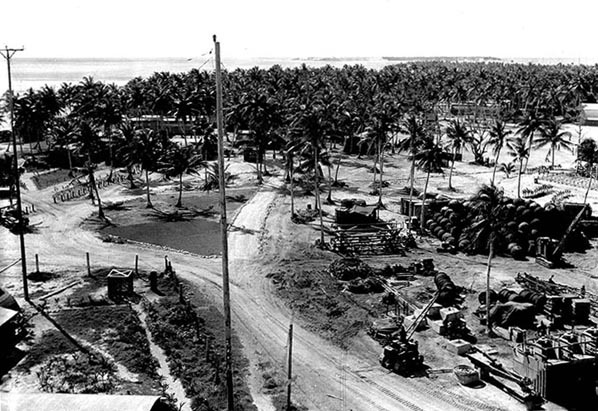 New changes came slowly over the next few decades with the lingering presence of Americans in Ulithi. At first this included particularly the Coast Guard.